in Search Marketing with tags Google, Google SERP, paid search, sem, seo Both comments and trackbacks are closed. Below, we give a more in-depth overview of the changes and dive into the SEO and SEM implications in greater detail. Up until last Friday, a Google desktop search produced a Search Engine Results Page (SERP) with up to 11 paid search ads (3 appeared above the organic listings and 8 on the right hand side). Google’s altered SERP now places up to 4 paid search text ads above organic, and up to 3 paid search text ads below. These ads are referred to as top ads and bottom ads, respectively. The maximum number of extensions when 4 ads appear on top will be 8, with the maximum number of extensions for any single advertiser being 3 According to Google, this change is supported by extensive testing and is designed for highly “commercial queries,” a term they have not defined with specificity. Google states this new layout provides much more relevant results, while also providing better performance for advertisers. The alteration will have a bearing on several aspects of the SERP across both paid search and organic. Search auctions with 5 or more advertisers will be impacted. Most brand terms have very little competition and will be unaffected. With a max of 4 top ads, advertiser competition will increase to maintain visibility, which could produce higher desktop CPCs, This will be dependent on how much traffic is affected, which is not yet known. However, according to WordStream’s Larry Kim, Side Ads (right rail) and Bottom Ads account for just 14.6% of click volume. Non-brand 2-line sitelinks will now collapse the description, taking up less real estate and making room for the additional top ad position. Knowledge Graph and shopping campaign ad results will continue to populate the right-hand rail. The change does not affect mobile at this time and is only for Google.com. 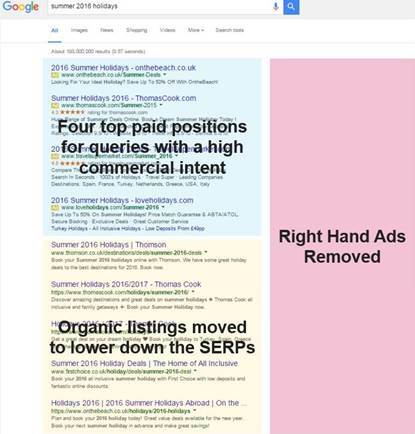 Unsurprisingly, the top ad paid positions above organic listings historically have benefited from higher click-through-rates (CTR) compared to right-hand side ads. On average, CTRs in positions 1-3 often double that of the average positions of 4-6. Therefore, moving position 4 to the top of the page is likely to benefit advertisers in achieving a higher CTR and generating higher impression share. The challenge, however, is for ad listings occupying positions lower than 5 where advertisers will likely see reductions in CTR and impression share as these results are demoted to the bottom of the page. There are two likely and opposing scenarios that could occur. Some marketers will become more aggressive with their bidding strategies as they strive to maintain impression share and, as a result, will lead to increased CPCs. Unless marketers adjust goals, this scenario will likely be short term as advertisers optimize bids to meet goals. The other scenario is that marketers will not see much impact. The rationale is that positions 5 and lower already have comparatively significantly lower CTRs, and in many cases there is little value in occupying position 5 and below from a traffic acquisition perspective. And again, the amount of affected traffic is not known at this time, and the impact will be highly dependent on that factor. The second scenario is something retailers have been experiencing since the launch of Google Product Listing Ads (PLAs). Google’s PLAs have dominated the right hand rail for the past two and a half years, pushing Paid Search Text Ads well below the fold. Testing by Google has shown that PLAs have outperformed text ads in the right rail (360i’s data show a clear trend of lower CPCs on the right rail), so it is possible that the new layout will not have much of an impact on traditional SEM. What’s important is that advertisers monitor changes carefully to quantify the new layout’s impact to overall performance, impression share, and revenue contribution. With paid listings now taking up more real estate within the SERP, organic listings will be pushed further down the page, and organic traffic could suffer for keywords ranked lower on the first page. However, similar to paid search for retailers, SEO listings have long been pushed to below-the-fold visibility. To that end, searchers who want non-ad based results already scroll down to find organic results. In 2013, Google had increased regulatory pressure to better distinguish between advertisements and non-ad listings in its SERPs. This was a nice win for organic listings that often capture users who already have natural bias against paid results. As a result, one could argue that SEO CTRs will not change. With that in mind, SEO visibility requires the best content to earn top position in the organic results. SEM will continue to piggy back off SEO strategies that develop amazing landing page experiences aimed at the early stages of the consumer journey. Advertisers not in the top organic positions will still need to develop better organic content as these pages will help offset raising CPC cost with improved quality scores. To that end, SEO will continue to play a large role for advertisers in earning consumer trust throughout the customer journey in that high quality content aids in building awareness and facilitates consideration and purchase. It is now more important than ever for a marketer’s SEO and SEM teams to work closely together on strategies to identify where SEO can offset rising Paid Search cost and where Paid Search can capture lost organic traffic. As is the case with Paid Search, monitoring how the changes to the SERP impacts SEO will be key over the coming few weeks and months. Only time will tell how Google’s SERP layout change will impact searchers and advertisers. At the moment it appears that well-known advertisers with large search budgets will continue to thrive while small businesses could be crowded out of auctions in which they currently compete. Google is not projecting this scenario based on its tests, but it is a clear possibility. Regardless, the best way for marketers to combat rising cost and win in search is to optimize the customer experience from search to website visit. As a result, quality scores and conversion rates will move in the right direction, offsetting any impacts to cost. Marketers should continue to seek out and gather information that will refine their strategies. Jason Hartley, VP US Search Practice Lead, Michael Dobbs, VP SEO Practice, Kenneth Hamner, Associate Media Director, Sam Franklin, Head of Decision Sciences, Eli Kaufman, Director of Custom Technical Solutions, contributed to this post. Cover photo via Droid Views.